Sunday morning, I had the pleasure of dining and chatting with the ladies of Women Who Brunch and enjoying Life Coach Caroline Zwick‘s presentation on how to make goal setting effective and fun. Perfect for late January, when we’re still in the beginning stages of formulating and carrying out New Years Resolutions! So yes, brunch + resolutions = bresolutions. The group met up at cozy Soho spot Jack’s Wife Freda. 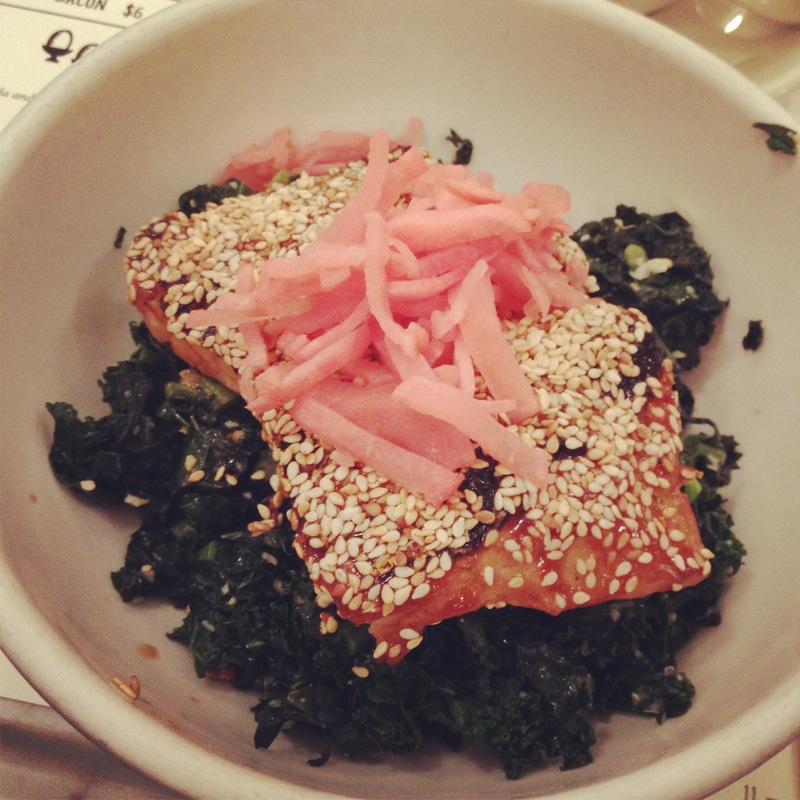 The menu was full of delicious things (green shakshuka, Mediterranean breakfast, rosewater waffle…), but I eventually decided on the soy-glazed fish a la plancha, which came over sautéed kale. It was definitely the right choice-probably the best thing I’d eaten all week. Caroline gave us each a handout of 7 guidelines for making and meeting our goals, and the one that resonated with me most was the last: CELEBRATE YOUR ACHIEVEMENTS!!!! This has always been a really hard one for me—by the time I’ve reached a goal I set, I’m already onto climbing the next mountain. It had never occurred to me to make celebrating my successes a rule, but damn—how could I have spaced on something so important? 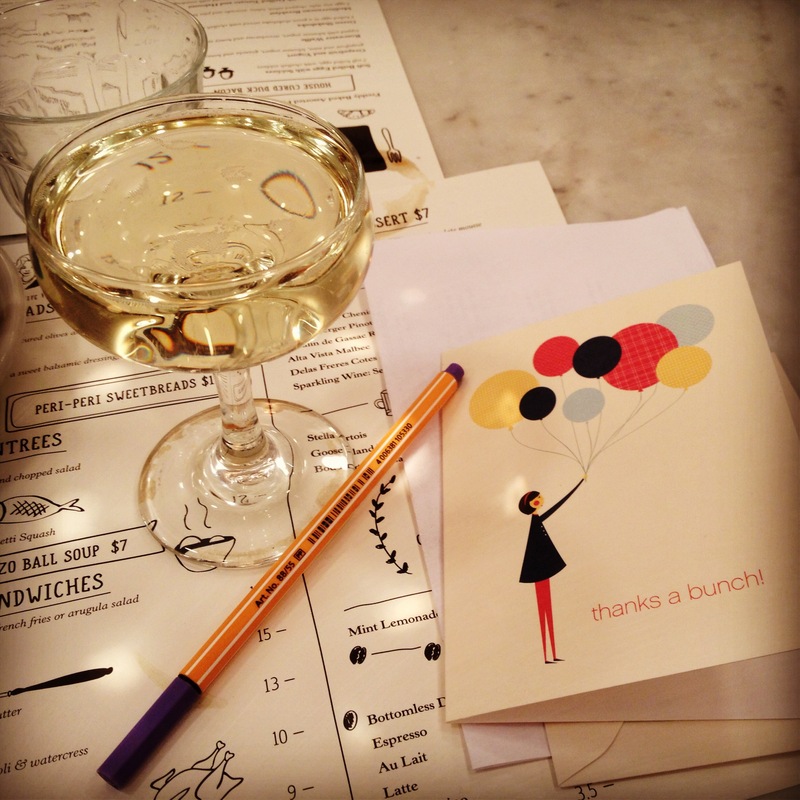 When we ordered a round of drinks (cava for me, of course) after eating and wrote letters to ourselves, to be sent in a few months. You’d better believe I started off with a friendly reminder to take a sec to celebrate. And to say thank you to yourself for not giving up on…yourself. For not laughing at your “crazy” ideas or “impossible” goals. I had been planning to treat myself to a reflexology massage after the busy two weeks I have where my two clinical jobs overlap as I transition from one to the other, but instead, when I got home from brunch, I called up the Chinese bodywork place I go to and made an appointment for that afternoon. So. Damn. Good. I asked the massage therapist to focus on my scalp and shoulders. Why don’t I always do that? Also, I can’t say I’d ever had my hair pulled during a massage before, but, um. Wow. It was kind of awesome. What is the hardest part of setting and achieving goals for you? How do you celebrate your successes? This entry was posted in Uncategorized and tagged brunch, bubbly, caroline zwick, cava, fish, goals, kale, NYC, weekend, women who brunch. I fear not accomplishing my goals – big or small, so that’s a problem. When I make resolutions in the form of baby steps or even group up with others, I see more success. Also, cava is my absolute favorite adult beverage 🙂 I think it’s because I picked up a liking for it when I studied in Barcelona. Those both sound like great approaches. Also, that’s so awesome that you studied in Barcelona! When I was a kid and tried to celebrate my success, my mom always told me nobody likes a braggar. That’s stayed in the back of my mind for a long time, but nobody likes a downer either. Finding balance in the middle is tough but I think it’s better to err on the side of braggar than downer. It’s definitely quite the balance! I have to push myself really hard to err on that side too. I wish I could remember where I got it in my head that acknowledging my accomplishments was a bad thing but it’s such a hard voice to get rid of.